Main Office: Comitato di Gestione Provvisorio del Parco Nazionale dell'Asinara - Via Iosto, 7 - 07046 Porto Torres (SS) - Tel. 079/503388 - Fax 079/501415. By car: from Sassari on freeway SS n. 131 to Porto Torres; upon arrival, the ferry to the island or the provincial highway to Stintino. By ferry: from Porto Torres or Stintino where there is a ferry service to the island. Porto Torres can also be reached from Genova by ferry. In Brief: Despite its recent creation and the fact that the Park is a protected area, the management staff of the Asinara National Park has successfully created facilities that can be used by a widespread public. 5 out of the 10 facilities - including centres for environmental education, cafes, points of special interest etc. - can also be enjoyed to visitors with mobility limitations such as elderly people, children and people with disabilities. The management staff of the Park has facilitated Park access for such people through its connection to the mainland via specially authorized boats to Asinara. Itineraries: The island can only be visited after having received authorization from the Provisional Management Committee. Park Outline: Asinara was created as a self-contained National Park in accordance with L. n. 344/97. It hosted a prison for many years. Asinara is, in effect, the last island of this size within the whole Mediterranean area that doesn't contain any significant residential areas. 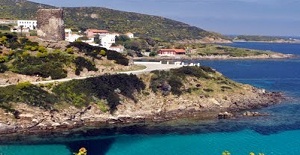 The Asinara National Park also safeguards an area of the North-western coast of Sardegna, which includes the island of Asinara itself and its surrounding waters. The old prison structure, which was still in use up to only a few years ago, is present on the island. Wildlife: Mediterranean vegetation, also known as the Mediterranean maquis, completely covers the island although fires and other sources of environmental degradation have thinned out the vegetation. A small wood of Holm oaks, near the northernmost point, is a reminiscent of the original vegetation covering the island. The western coast is higher and includes steep slopes while the eastern coast is flat. The highest point reaches 408 meters and is called the Punta della Scomunica. 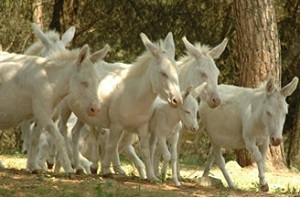 The island also holds a limited number of small Albino donkeys, which are a special yet mysterious characteristic of the Park, because the origin of these animals is unknown. A small herd of Mouflons, the descendants of a pair introduced about ten years ago, roams the rockiest areas of the island. 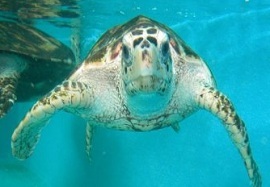 Birds, however, are the most numerous species present on the island. Many birds rest on the island during their migrations or use it as a refuge during their nesting periods. These include the Barbary partridge, the Peregrine falcon, the Herring gull, the Pygmy cormorant and the rare Audouin's gull. The sea surrounding the island is also rich in sea life, which includes colored Sea anemone, Star-fish, Sea fan, Octopus, Moray, Dusky perch and White seabream which live in the vast underwater sea prairie of Mediterranean seagrass. Recreational fishing, but not commercial fishing, has always been forbidden in this area as also was underwater diving because of the presence of the prison. Today, these activities are strictly regulated due to the presence of the Park. History and Culture: Numerous findings of flint and obsidian tools demonstrate the long presence of human life on the island since pre-nuraghic times. Plinius the Elder called the island "The island of Hercules" and it was an anchoring point for ancient navigators throughout the centuries. Various derelict ships have been found along the coasts including lead bars embossed with the ancient Roman stamp. Between the Middle Ages and the 16th century, Asinara was a battlefield in the battles between Pisa and Genoa against the Saracen pirates. For long periods, however, the island was deserted or inhabited only by small groups of shepherds in a subsistence economy. Buildings of historical interest are also present, such as the Monastery built by the Camaldolesi in the XII century in the area of S. Andrea and the fortifications of Torri di Cala d'Oliva, Cala Arena and Punta Trabucato. The hills of Fornelli also host the ruins of Castellaccio. Asinara suffered isolation in the last century; first as a Health Quarantine Station and later as a WWI Prison Camp. Following this, and until only a few years ago, it was an high security Italian prison for terrorists and members of organized crime. Typical Products and Craftwork: The local cuisine is greatly influenced by the presence of the sea (the area of Sassari in particular) and local specialities include grilled fish, lobster and first courses such as maccaroni which is a pasta dish with shellfish and crustaceans. A fine Sardinian Vermentino wine accompanies these dishes. The carasau or carta de musica local bread is also highly recommended.